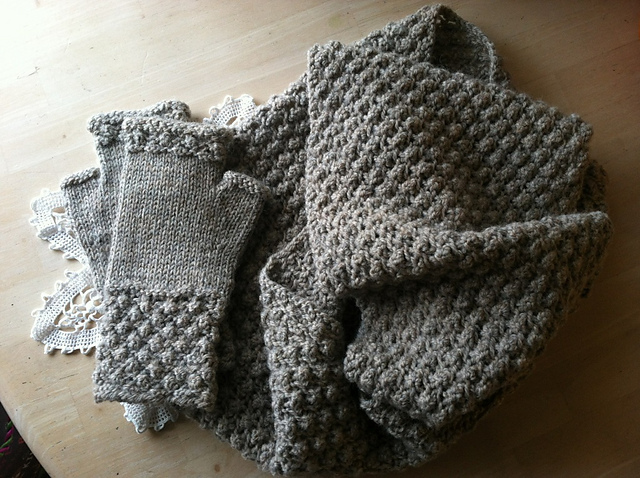 Budding Infinity Scarf knitted by @momfourgirls via Ravelry. My gauge was slightly smaller than it should have been, so it took two skeins plus I had to start another for the final round. Grr! For a while I thought it was called an infinity scarf because the number of bobbles makes it feel like it’s going to take forever. However, I did get through it and even had the courage to do more bobbles – so I made the Peridot fingerless gloves to match.